Teotitlan del Valle, a stubborn outpost of antiquity, rises off the dusty desert floor in Mexico’s Central Valley region like a mirage in summer. Thirty minutes outside of Oaxaca City, this tiny hamlet was one of the earliest settlements of the ancient Zapotec civilization, and has remained in the hands of their descendants since 1465. Teotitlán, the Nahuatl word for “Land of the Gods,” seems an apt moniker for a place in which the spirits of the past loom so large in the present. Fiercely protective of their identity and traditions, the inhabitants of Teotitlan del Valle have found a way to preserve much of their ancestral way of life, while granting only the necessary concessions to modernity. 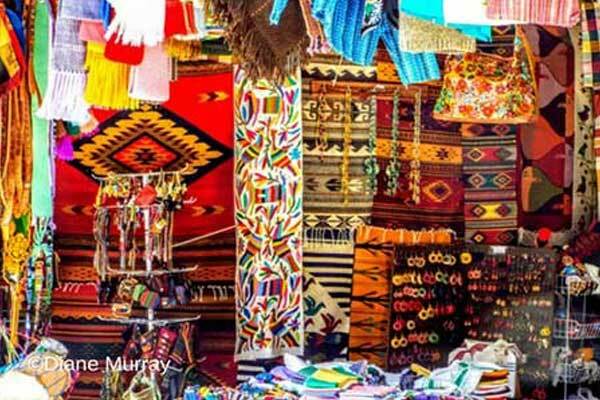 The unique quality, beauty, and value of their woven wool rugs have attracted enough economic activity and curious day-trippers to the town to allow the residents to survive in the 21st century, largely through the same means that sustained their ancestors for thousands of years. 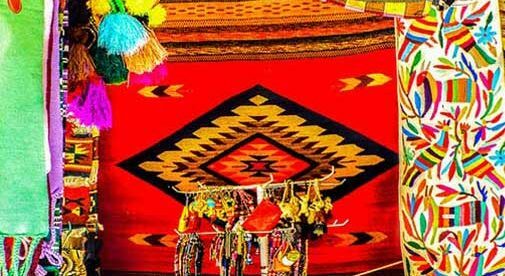 Historically, the Zapotec protected their way of life by offering their exquisite weavings as tribute to the ruling Aztecs of the time. Today, opening up their shops to the outside world is enabling them to preserve their traditions within the modern world. Weaving has been a mainstay of the economy of the area since 500 BCE, when a torturous-looking contraption called a backstrap loom was in use. The fiber used back then derived from plants such as yucca, palm, and a local variety of cotton. In 1535, Dominican Bishop Juan López Dezárate introduced sheep and treadle looms brought from Spain. These innovations allowed for the production of the large, heavy wool rugs upon which the area’s reputation has been built. Many of the looms in use today date back centuries and represent the inheritance passed down through the generations. 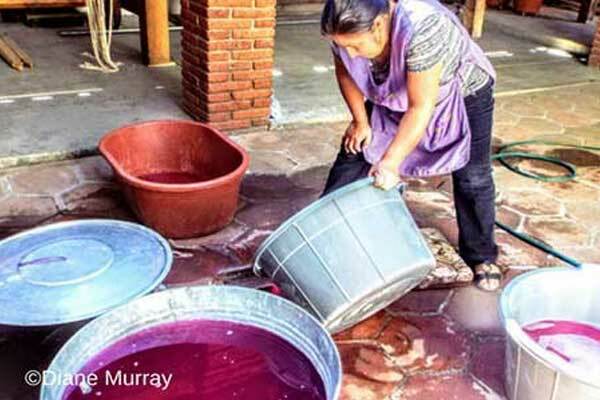 Adhering to tradition, The weavers of Teotitlan del Valle use natural dyes extracted from environmental sources such as the needle bush, rock moss, Brazilwood, indigo, cochineal beetles, pomegranate zest, and Mexican marigold. Freshly-dyed yarn is then left to dry in the sun. These age-old processes are time-consuming and labor intensive, but produce a superior true and lasting color which increases the value of the end-products. Over 150 families in this town continue to operate traditional weaving workshops. Equal parts ritual and routine, the weavers reproduce the intricate, ancient designs of their ancestors via a combination of mental recall and memory. Printed plans are unnecessary, as these motifs have been passed down through countless generations and practiced as a way of life for both men and women from an early age. Finding the sacred in the repetitive and the mundane, is just one more form of artistry on display in these family workshops. 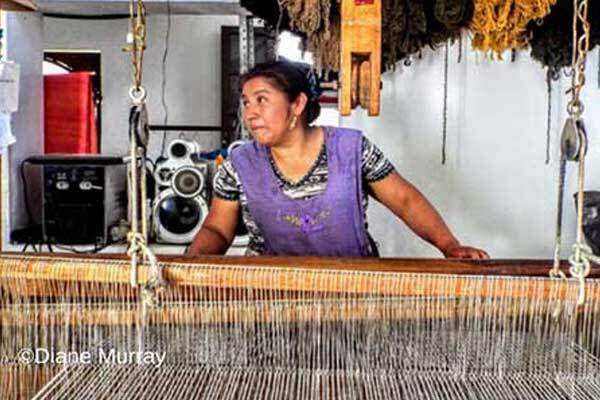 The highest quality handmade rugs produced by the weavers in Teotitlan del Valle incorporate the finest wool, natural dyes, and traditional treadle loom techniques. Even small pieces can take weeks to complete, depending on the intricacy of the design. Gallery prices for a top-quality 15-square-feet rug can range from $500 to $700 a piece. The quality of the fibers, trueness of the dye, and the tightness of the weave create an heirloom that, when well cared for, should endure for generations, and only increase in value. In response to demand from tourists, the weavers of Teotitlan del Valle have now expanded their wares to include table runners, place mats, ponchos, sarapes, handbags, curtains, and scarves, some of which utilize commercial dyes and fibers, providing opportunities at lower price points. Weavers have also begun reproducing famous works of art and creating custom designs, making it easier than ever for those who visit this tiny town-in-a-time-warp to return home with a bit of antiquity.